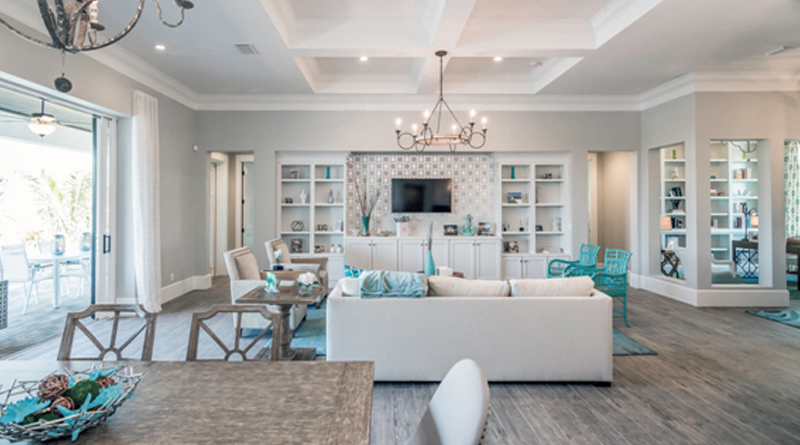 Clive Daniel Home, the award-winning design firm and home furnishings retailer, has recently installed furnishings for Green Coast Homes’ Monaco model at 618 Monaco Drive, located in the Burnt Store Isles community of Punta Gorda, Florida. The base price for this model is $550,000. Clive Daniel Home interior designer Wilfredo Emanuel, IDS, was the lead designer for the new Green Coast Homes model. For more than 12 years, Green Coast Homes (www.greencoastfl.com) has been building and renovating homes throughout Southwest Florida, to include the barrier islands. With offices in Punta Gorda and Naples, the company specializes in incorporating sustainable building practices with superior craftsmanship. Headed by partners Brian Sujevich and Carlton Hughes, they also provide Design/Build and Construction Management project delivery methods. Burnt Store Isles (BSI) is a deed-restricted, waterfront community with Twin Isles Country Club (formerly Burnt Store Country Club) situated in the center of the community. “It’s rare to find a beautiful waterfront community where you can dock your boat behind your home and then walk across the street to the Country Club for a round of golf or just to socialize. There is no requirement to join the Club,” commented Carlton Hughes. Burnt Store Isles is part of the older and larger community of Punta Gorda Isles – with about 2,500 homes – and includes approximately 1,000 canal-front and 400 golf-course homes and lots with boating access to Charlotte Harbor via Alligator Creek, a natural river. All waterfront properties are in the Canal Maintenance System, maintained by the City of Punta Gorda. Clive Daniel Home (www.CliveDaniel.com) located on U.S. 41 in Naples and in Boca Raton, Florida. Contact Daniel Lubner at 239-292-3717.